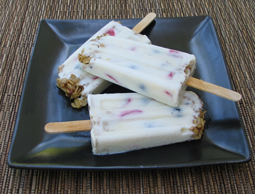 Yogurt-Granola Popsicles - A recipe from Savor California, the online showcase for extraordinary gourmet foods and beverages from California. Mix yogurt, milk and tablespoon of honey until smooth. (It's easiest if this is done in a large measuring cup with a pour spout.) Set aside. Put a layer of the granola mixture in the bottom of popsicle molds. Pour in the yogurt mixture, alternating with the fruit. Top the molds with more of the granola mixture.